2011 Annual Report Friends’ Bookstore The past year was a full and busy one; here are the highlights of the successes and changes in the store. At the beginning of 2011, the Bookstore Committee decided to begin taking debit/credit cards. Because the Bookstore is a non-profit organization, it gets a special rate from the company, both in the monthly fees and in the per-transaction costs. We saw credit/debit card sales double each month for the first four months. Now the number of customers using debit/credit cards has stabilized, but we hear multiple compliments regarding the fact that we now accept plastic. The Bookstore participated in several special sales this year, including the White-Out Wednesday sale held on the Wednesday before Thanksgiving and sponsored by the Rochester Downtown Alliance. The details of the sale were kept secret until the day of the sale, and that created a bit of buzz. In the end, we offered everything in the store at half price and made over $850. The sorters have been kept busy this year and estimate that they receive an average of 500 books daily. The sorting system has been working very well, with the library taking all that they need for their collections before the Friends begin to select materials. The Bookstore does not lack for books, and we have special sales when one category is full. For example, right now children‟s books are buy-one-get-one-free. The Bookstore donates many, many books and other materials to other organizations. For example, Channel One gets new children‟s, adult fiction and nonfiction books each week. We regularly send shipments to the soldiers in Iraq and Afghanistan, often fulfilling requests. 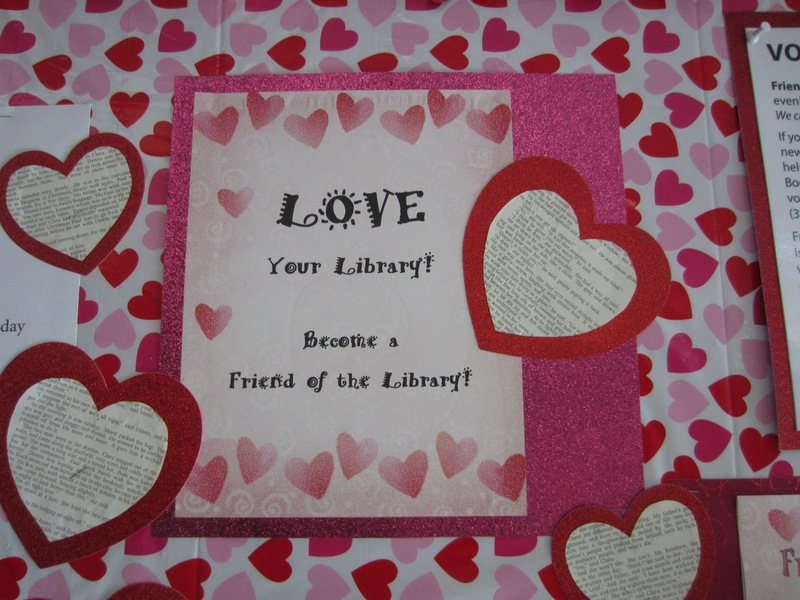 We have donated to other libraries (in Minnesota, in the United States, and overseas), to local charities, and to area schools. We also provide books to new teachers so they can begin establishing classroom libraries. When we have author visits (Catherine Friend in June, the Minnesota Crime Wave, Kamala Nair, and Paula McClain for examples), the Bookstore purchases copies of the author‟s books and sells them during the author visit so patrons have a chance to get the book signed. We also help with set-up and teardown of the auditorium and provide coffee and cookies. The Bookstore sponsored a Mystery Tea and enjoyed an overwhelmingly positive response. Bookstore volunteers and Library staff members were the actors, and everyone baked goodies. We borrowed round tables from the History Center, and their success lead to the Friends Board and Foundation purchasing round tables for use at large auditorium events. Individual Friends purchases table cloths and carafes. In February, the Bookstore sponsored a Food for Thought fundraiser for Channel One, giving customers a discount if they brought in a food donation for Channel One. The store will be participating again this year as Channel One attempts to collect a Mile of Mac „n Cheese. Many new volunteers joined the Friends in both the Bookstore and in the sorting area. We continue to grow. Due to the hard work and dedication of all, the Bookstore is making a record-breaking donation to the Library. 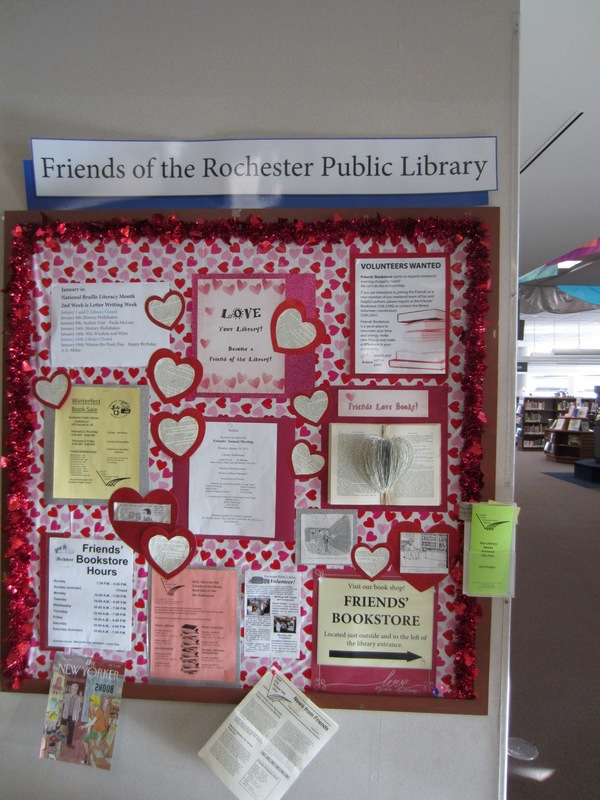 The Friends‟ Bookstore Committee voted on Monday, January 9, 2012 to donate $57,000 to the library, leaving a small reserve so we can pay our bills. This amount is a $5,000 increase over last year‟s donation. nd Saturday Sales continued to be a big hit. In 2010, the sales were a new idea to attract people into the store. During 2011, many of the library patrons were familiar with the Friends’ Bookstore, and we saw the benefit in large increases in sales. 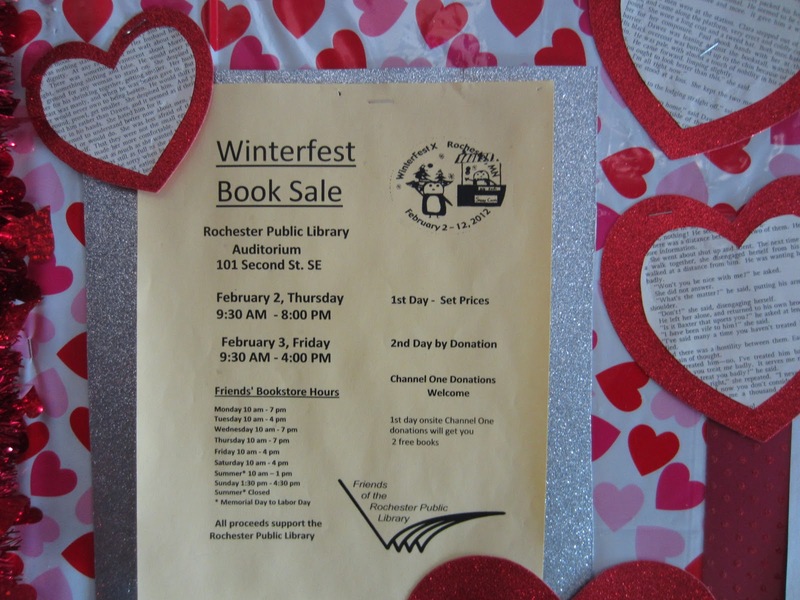 Don’t forget next week we have a fantastic booksale in the Library Auditorium during Rochester’s Winterfest celebrations. 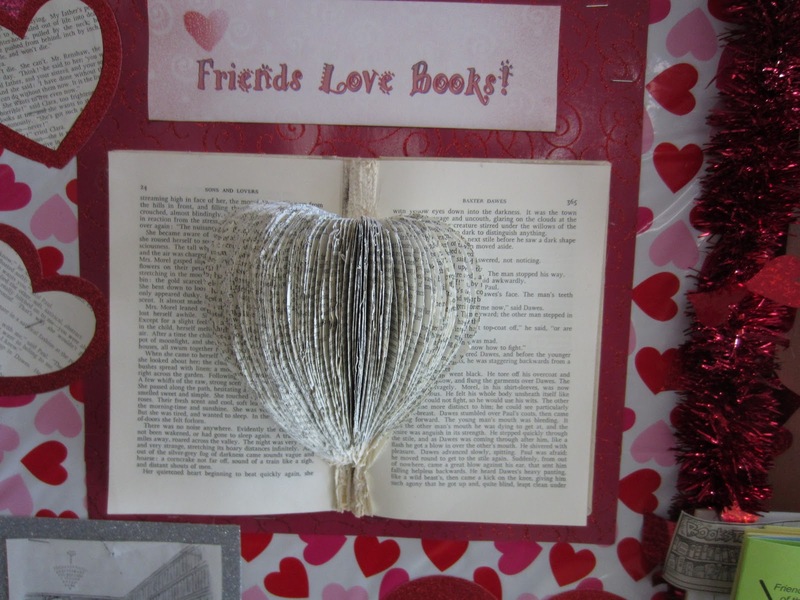 We have a fantastic selection of fiction, hardcover and paperback, an amazing array of non-fiction items, including vhs, cassette tapes, cds, dvds and audio tapes (the latter will be in the Twinkle room). We will also be collecting food donations for Channel One on the first day of the sale – so if you bring in a non-perishable item you will receive a discount on your purchases! AND remember, the Friends get in 30 minutes earlier to peruse the great selection! Time to join now! Did you know you can now receive instant updates of this blog via your e-mail? Just go to the right side of this screen and type in your e-mail address in the box provided. 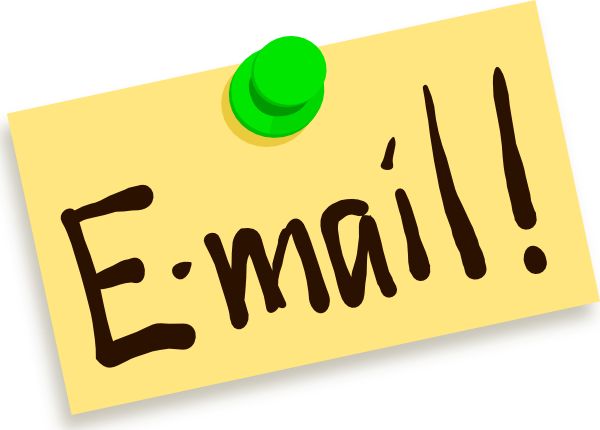 Each time a new blog is posted, you’ll receive a copy in your e-mail inbox! Another Great Selection of BOOKS at fantastic PRICES!! Don’t miss your next winter read! Food For Thought – Last year we put a Channel One barrel in the store and offered a 20% discount to folks who made a donation (hopefully a protein) to the store. This year if folks spend $25 in the store, they’ll get a free tote bag. 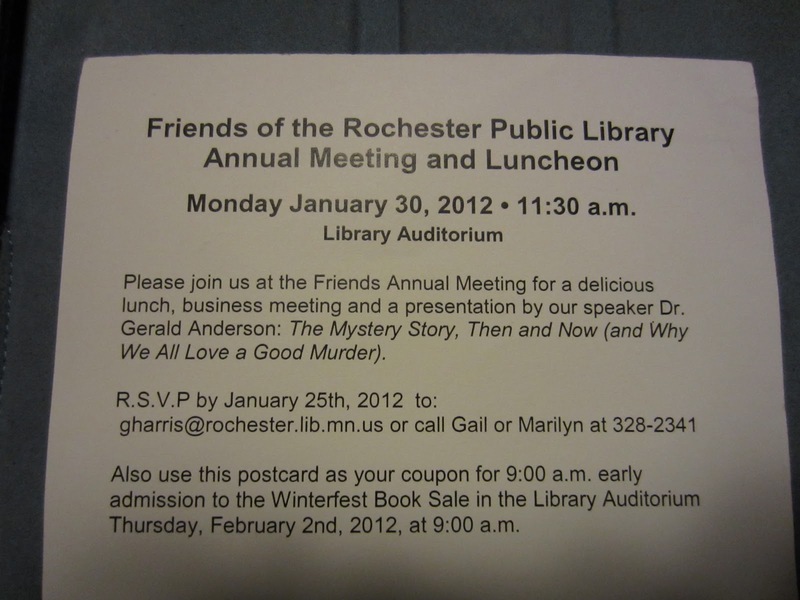 The Friends kick that off Food For Thought at the February 2nd/3rd Auditorium Sale. Channel One’s goal is to collect a mile of mac ‘n cheese. We will be selling boxes of KRAFT mac ‘n cheese at the auditorium sale so folks who didn’t bring boxes along can take advantage of the discount at the sale. We will give folks a discount off their entire Winterfest purchase with a mac ‘n cheese donation. Two-fer Tuesdays – Tuesdays are a quiet day in our store (making it a perfect time to browse!). In order to entice you in on Tuesdays, we are going to try a “Two-fer Tuesday” sale during the month of March. Customers will be able to buy-one-get one (of equal/ lesser value) free. That will apply to most items in the store, the exceptions being the Rochester Reads books and the new canvas bags. 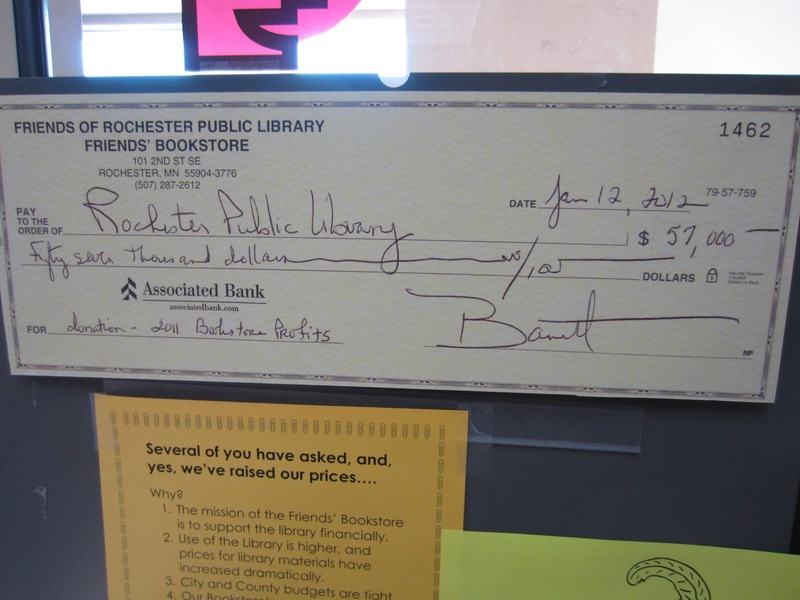 NB::The Rochester Reads books will be here by February 13, and the bags are already in the store. I can’t imagine too many things more challenging for a juvenile fiction author than trying to write so that your books appeal to both your young readers and their parents. More often than not, a writer really hits a home run with the kids but leaves the parents either appalled at the content or completely bored to tears. It’s a rare thing, in my experience, to find a juvenile fiction book that provokes serious belly laughs in my seven year-old son, while making me laugh so hard that I have tears streaming down my face. Surprisingly, Jeff Kinney has done exactly that in his best selling book, Diary of a Wimpy Kid. Narrated in diary format by the main character, Greg Heffley, Diary of a Wimpy Kid is a humorous inside look at the life of a middle school student who struggles to understand the new rules for being a “tween.” What really seems to make this book “work” is that it’s so real. Kids get the humor because they see themselves in Greg; and parents get the humor because they either remember what it was like to be a kid, or they see their own little rugrats in the actions of the main characters. Unlike some similar books of this genre, the author does a nice job of really showing the personality of the characters without resorting to misspelled words or truly bad behavior by the main characters to lure in the target audience. Greg and his friends do misbehave because, after all, that’s what makes it funny! However, the behavior isn’t extreme enough to cause serious objections from most parents. The reading level for this book is approximately 5th grade, but younger readers will really enjoy it as well, if read to them by an adult. And, frankly, I dare any adult to try to read this book without giggling at least once. I bet you can’t do it! This book is the first in a series of six with similar titles, and all are available through the Rochester Public Library in traditional format. 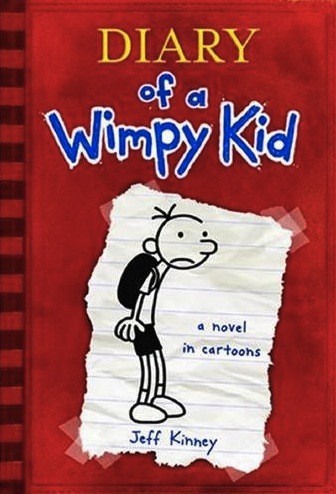 For more information about this book or the additional titles in this series, visit the website dedicated to the series at http://www.wimpykid.com/.